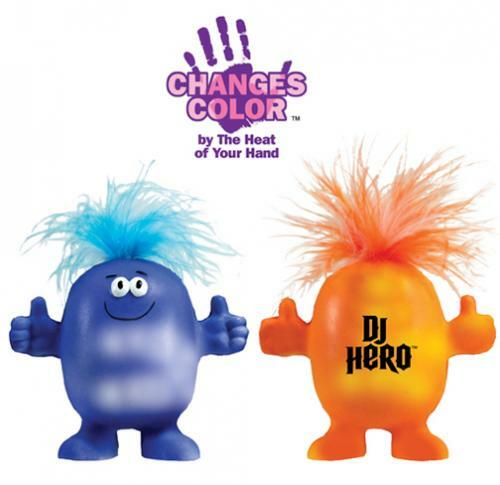 The Smilin' Mood Stress Dude changes color from the heat of your hand. 5 business days from art proof approval. Art Requirements : Vector Artwork Requirements: Our Preferred Programs are Corel Draw (15 or earlier) & Adobe Illustrator (CS3 or earlier, saved as an EPS). Text must be converted to curves, outlines or paths to ensure the art will be usable regardless of type-styles. Do not send fonts. All files imported into Corel Draw and/or Adobe Illustrator must be included separately & meet our Raster Artwork Requirements. Do not send files with linked elements. Re-Order Set-Up Charge: FREE for exact art re-orders placed within one year of previous order. New set-up charge(s) apply after 1 year. Ink Change Charge: $35.00 per change. Split Shipment. Add $5.00 each. Drop Shipment. Add $5.00 per location. Emailed art proofs: First proof is free. Additional proofs are billed $10.00 per proof.